Transtar Travel has been in operations since 1994. This Singapore based company provides coach travels and tours. Today, they provide routes beyond Singapore to major cities in Malaysia. 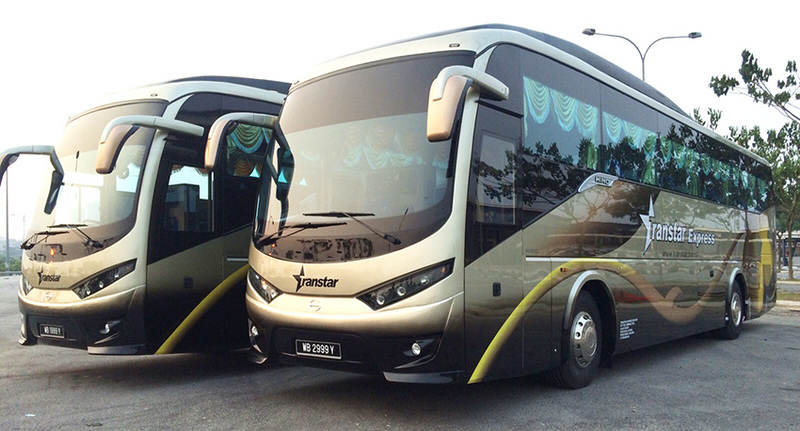 Transtar Express Premium coaches are fully air-conditioned with seats that recline. These seats are arranged in a 3 seats per row arrangement and ample of legroom between each seat aboard the bus. All their buses are equipped with 7.2″ LCD TV, massaging chairs and seat belts broadcast video system with 5 different channels, for entertainment purposes. Due to the quality of service over the years, Transtar has gained many loyal clients and achieved numerous awards and recognitions. Despite their success in the industry, Transtar never ceases to push boundaries, constantly improving to meet market demands and customer satisfaction. Their goal is to provide optimum comfort and services which reflects their vision to become the No.1 bus operator in Singapore. Hence, they constantly innovate, expand and grow to provide a safe reliable and comfortable coach service to their passengers. CatchThatBus offers online bus tickets to many routes covered by Transtar Express Premium as well as seat availability features. You can book your bus ticket online from our website or via mobile app which can be downloaded for free on Google Play or App Store.